We offer custom inflatable balloons that can serve as a platform that can be stood on as a working surface. These inflatables are often constructed using a 1680d Ballistic Urethane Coated Cordura. This allows for an extremely durable inflatable to be inserted into hoppers and other confined spaces. 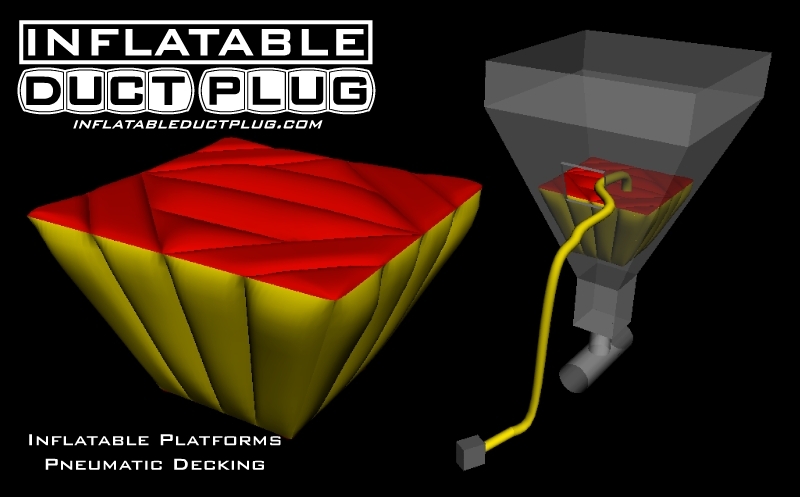 The inflatable function as a wedge, creating a surface that can be stood on and that will support weight of workers. A multiple inflation fan system can be included with these. This is accomplished by adding a Y to the inflation tube and connecting multiple inflation fans. Mulitiple fans must be run on separte circuits. The blowers are each equipped with a plastic louver system that prevents back flow in the case of one the blowers going off line. The inflation tube and flex duct can be made custom lengths to allow the blowers to be a specified distance away from the work area. Quotes on these styles of balloons require VERY detailed measurements of the area to be filled. Photos, blue prints and drawings of the hoppers or duct work also serve to be very helpful. These should be obtainable from the original manufacturer. Some cases may require an on-site visit to clarify details of the build before moving the project into fabrication.